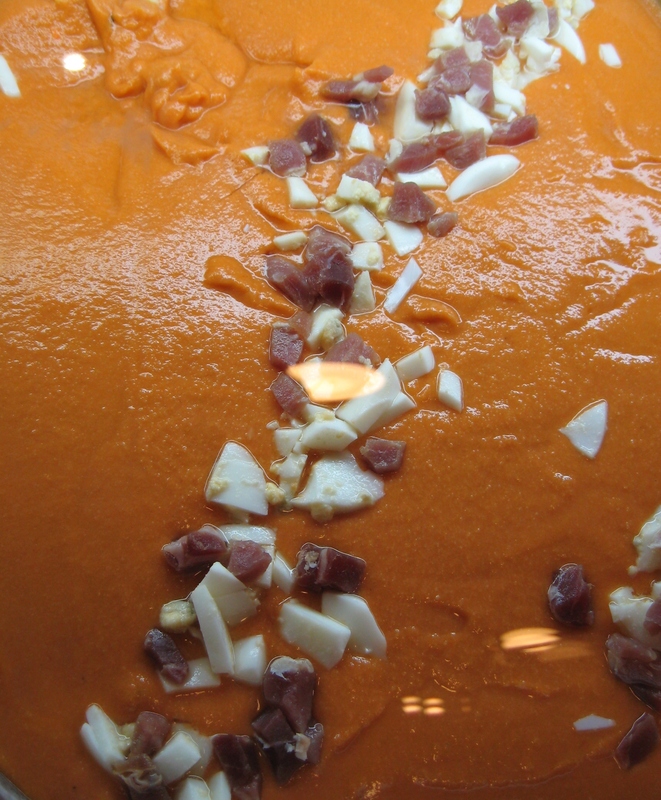 Salmorejo – Similar to the famous cold soup Gazpacho Andaluz but left thick enough to spread onto or dip your bread into. 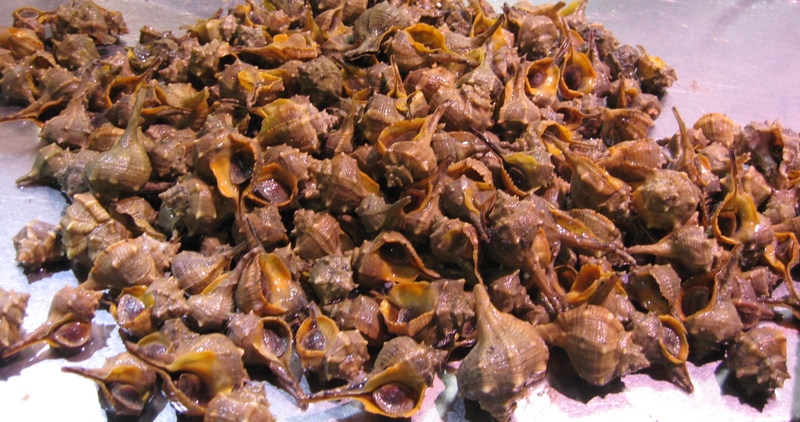 It is traditionally made by pounding the ingredients in a pestle and mortar, but is much more easily made in a food processor. Soak some stale bread in water until soft and then squeeze out most of the water. Roughly chop some good tasty tomatoes and turn them to pulp in the food processor. Put through a mouli with a fine disc or through a sieve to filter out the seeds and skins. Whizz together in the food processor a clove of garlic, the tomato juice and a generous amount of good fruity olive oil. Season well and thicken with the bread pulp until you achieve a thick spreading consistency. To serve decorate with chopped raw ham and boiled egg. 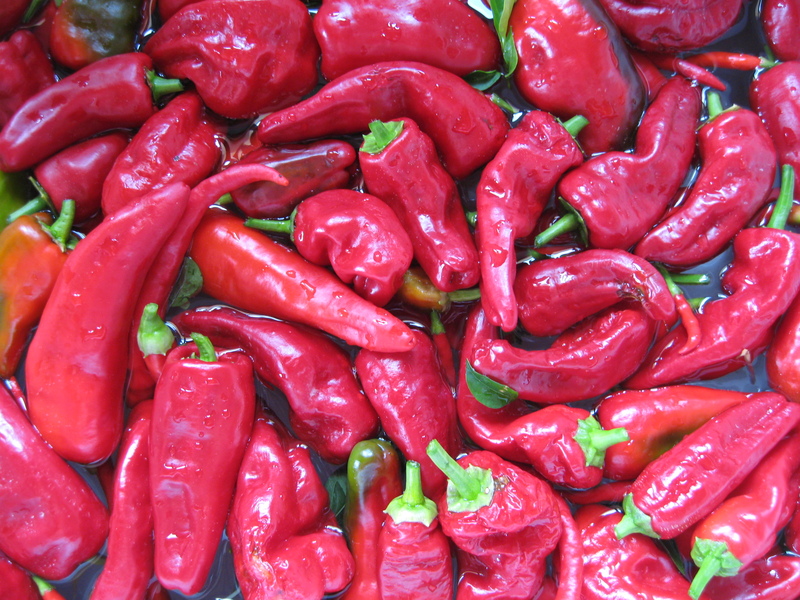 Pepper Salad – red peppers roasted or seared over a flame to remove the skins. 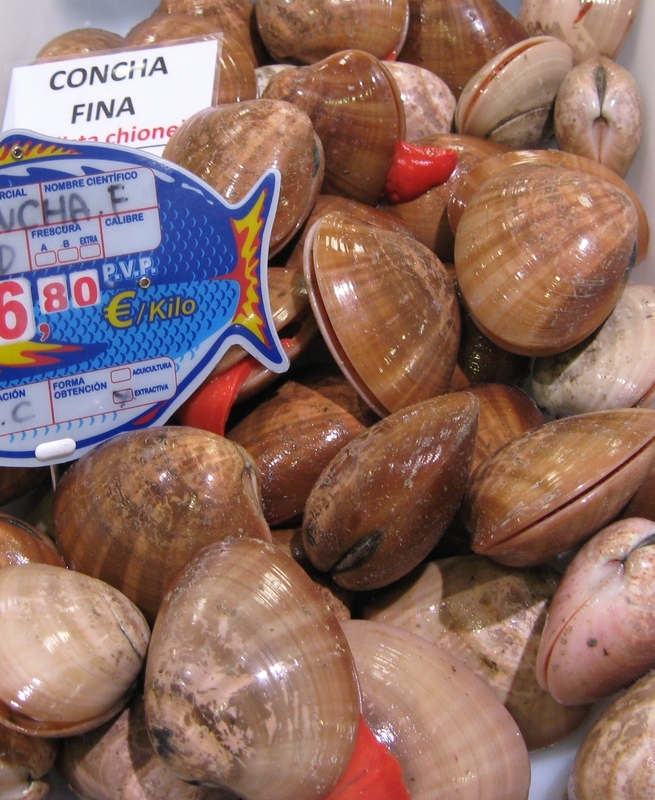 Sliced and dressed with olive oil and seasoned with salt, pepper and chopped parsley. 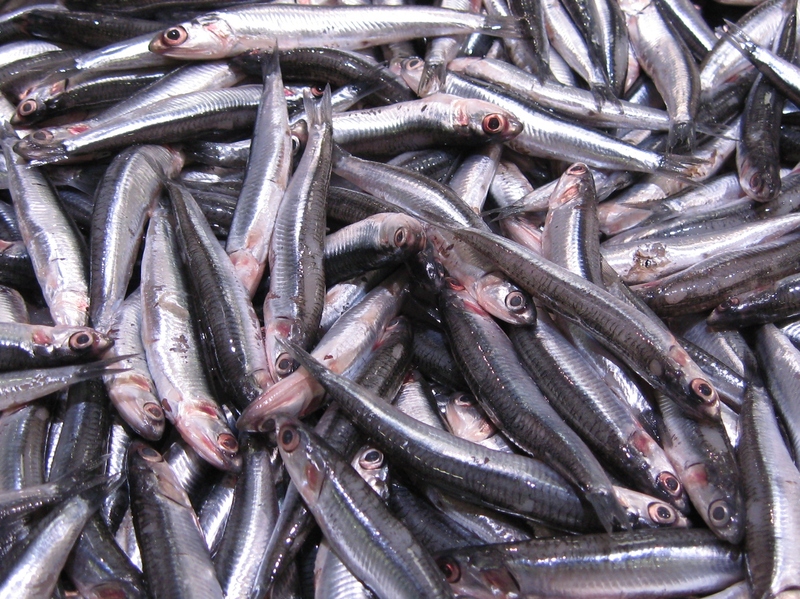 Boquerones al Limon – Smelts de-headed and de-boned, steeped in fresh lemon juice for half an hour then dried and dipped into thin batter and deep fried until crisp. 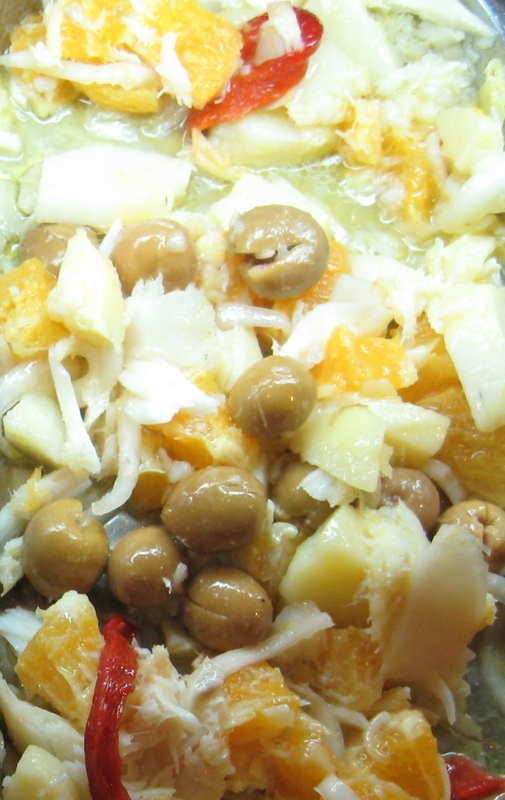 Ensalada Malaguena – Boiled potatoes, Salt Cod soaked overnight to remove salt and then poached until tender, sliced onions, chopped orange flesh, a few strips of red pepper for colour, all dressed with olive oil, white wine vinegar, salt and freshly ground black pepper. 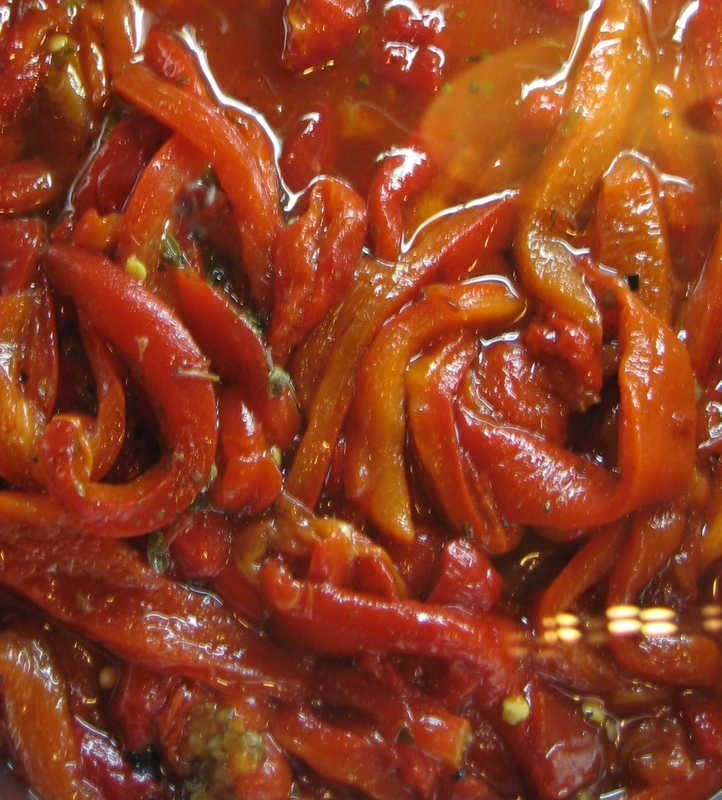 Berenjenas con Miel de Cana – This dish epitomises Malaga for me. In the tropical climate of the area sugar cane is grown and its bitter sweet syrup is used in many dishes of the region. 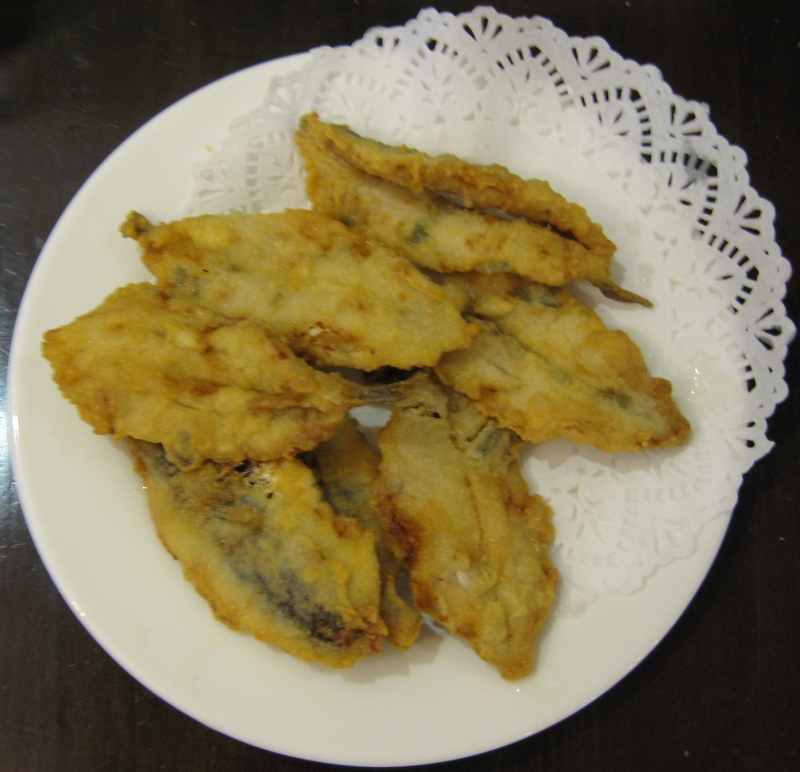 The aubergines are sliced very thinly, dipped in a light batter and fried until crisp and golden brown. 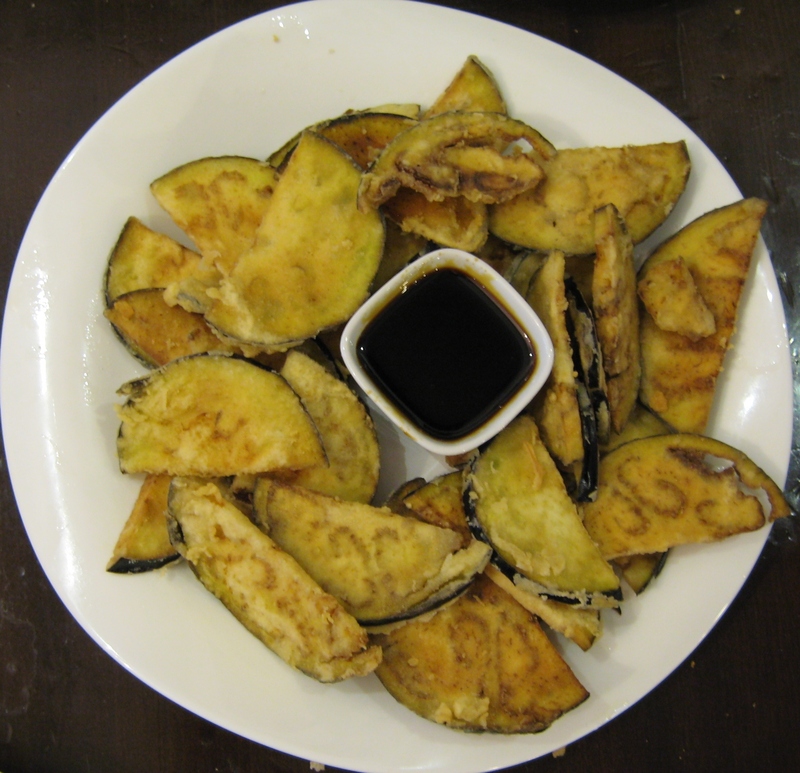 We were served them on this occasion with the sugar cane syrup in a little bowl for dipping, but more frequently it is drizzled over the aubergines. 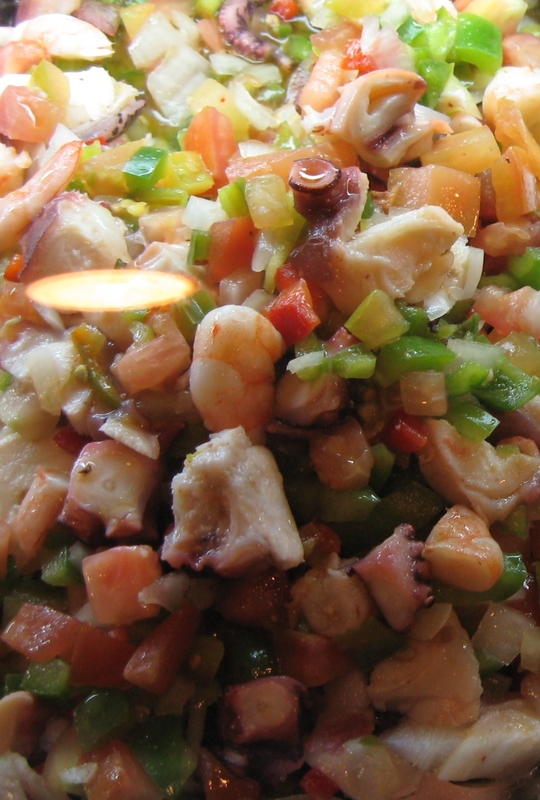 Salpicon de Mariscos – A salad of a mixture of shellfish, prawns, mussels, poached squid or octopus chopped small, finely chopped onions, red and green peppers and tomatoes in an olive oil and white wine vinegar dressing. Throughout my teenage years I cooked this dish for the whole family almost every Saturday lunchtime. It was taught to me by my father who is from Sarajevo the capital of Bosnia of the former Jugoslavia. Jugoslavia was for over five hundred years part of the Ottoman empire, and it was not until my sister and I were holidaying in Turkey on a Gulet with some friends that we realise that it is a Turkish dish. Our cook on the boat – Hali – made it for us all one lunch time and our friends loved it and wondered how it was made, to which my sister and I announced in unison that we could make it with our eyes closed! Quite a lot of English people think that they don’t like liver. And if their only experience of it is the stewed beef liver that was served to us at school, then I can fully understand them having a prejudice against it. But please give liver another chance. 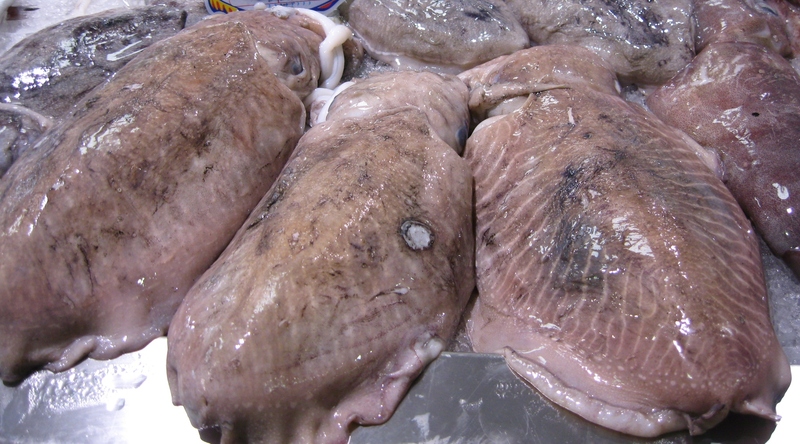 Think more those gorgeous liver pates and less the shoe leather of school dinners. Pork liver for me has the best texture and the sweetest flavour of all the livers, and this is what my family use for this dish although the with Turkey being a muslim country, lambs liver is used there. Firstly put the rice on to boil. 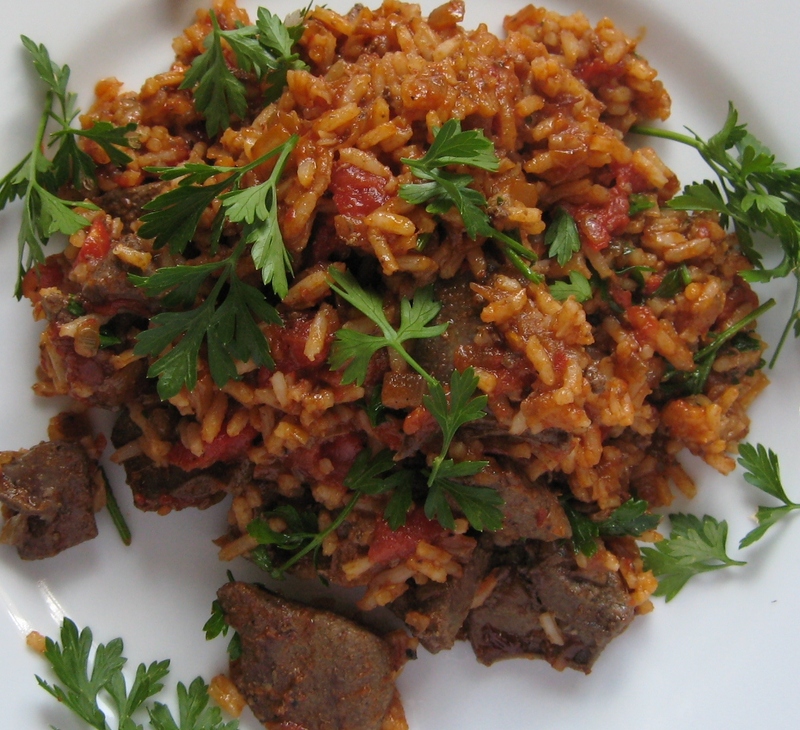 Use your usual method but you want the rice slightly al dente. Another busy day, and so another quick lunch, but that does not mean that lunch has to be dull and unexciting. 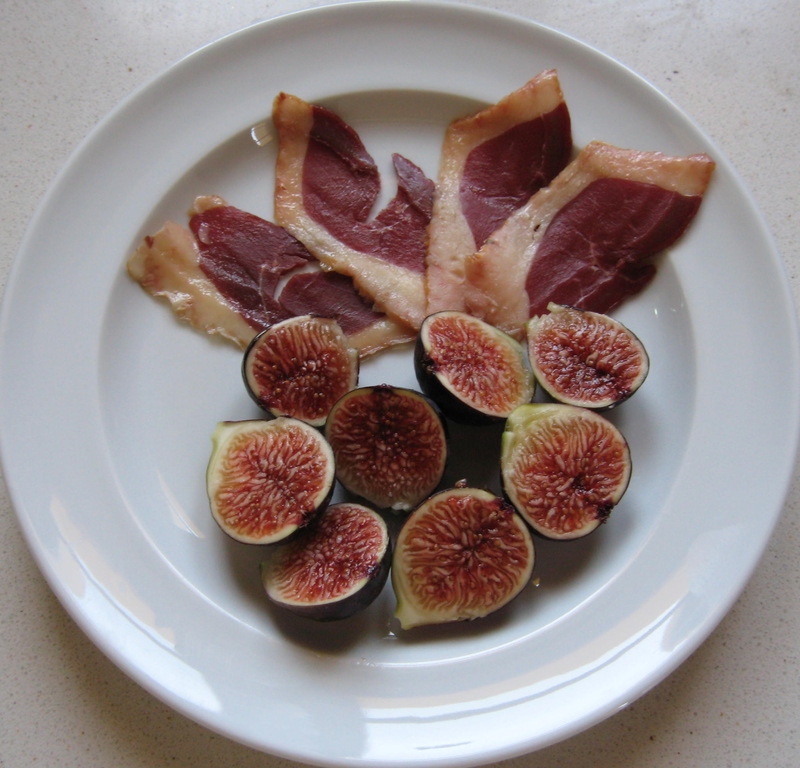 The self sown fig tree is still giving four or five sweet little irresistible black figs every day so I shall have those with some smoked duck breast while a risotto is cooking. I thought that I was going to make a courgette risotto, but when I went to pick a couple I was diverted by the sight of tiny yellow plum tomatoes and thought that combined with some pumpkin they could make a cheery golden risotto. 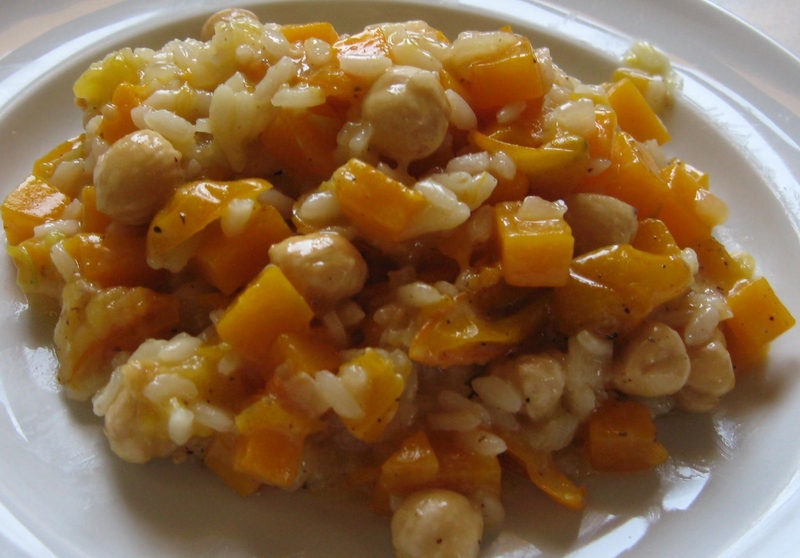 The hazel nuts added at the end give a crunch that contrasts nicely with the soft risotto. Oil for frying or half oil and half butter if you prefer the flavour. Heat a tablespoon of olive oil in a shallow pan and add the onions. 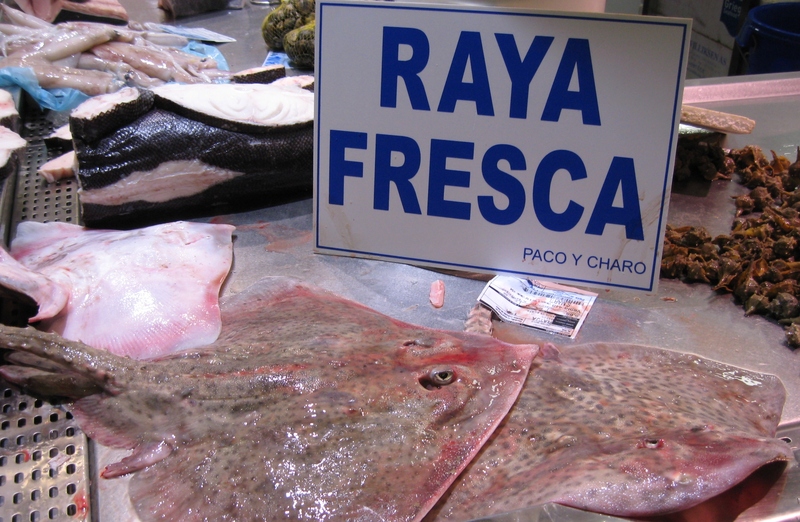 Fry gently until translucent. Add the pumpkin cubes and stir to mix in. Fry for five minutes stirring from time to time. Add the rice and stir to coat in the oil and pumpkin juices. Cook until the rice looks slightly translucent. Add the tomatoes and some stock and stir. Season with salt and pepper. Cover and continue cooking on a gentle heat, adding more stock as necessary until the rice is cooked. Stir in most of the cheese reserving a small amount to sprinkle on the risotto when you serve it. Add the hazel nuts and cook long enough to warm them through. Serve sprinkled with the remaining cheese. There is a lot of work to do on the farm at the moment as the season is changing. We have had the early September rain that signals the end of the summer. The Christmas potatoes needed to be already in the ground ready and waiting before the rain comes. They are just starting to show through now. The greenhouse contains hundreds of little pots of winter vegetable seedlings that have been hiding from the heat and will need to be planted out quite soon. There are Mange Toute Peas, Purple Sprouting Broccoli, Cima Di Rapa, a huge selection of salad greens,chicories and endives, Artichokes,Florence Fennel,Beetroot……..
Then there are the crops that are ready and need picking and/or processing. I have been making Preserved Tomatoes in White Wine and Chilli Jam this week which is one of the most popular products in the farm shop. Fifty Jars of the Chilli Jam and fifteen of the tomatoes, plus ten of Sun Dried Tomato Pesto which is one of my favourite sauces for pasta, or spread on toast and topped with mild cheese for breakfast. Picking and curing the olives will be next week, closely followed by the quince which are looking swelled and golden yellow since the rain. I don’t have enough olives to send for oil, so they will all be for eating and the quince will be made into jelly and a mustard conserve, which again is popular in the shop. There are only two jars left from last years crop, which looks like perfect planning. Because of all this activity, quick nutritious lunches are needed that centre on the vegetables from the farm. 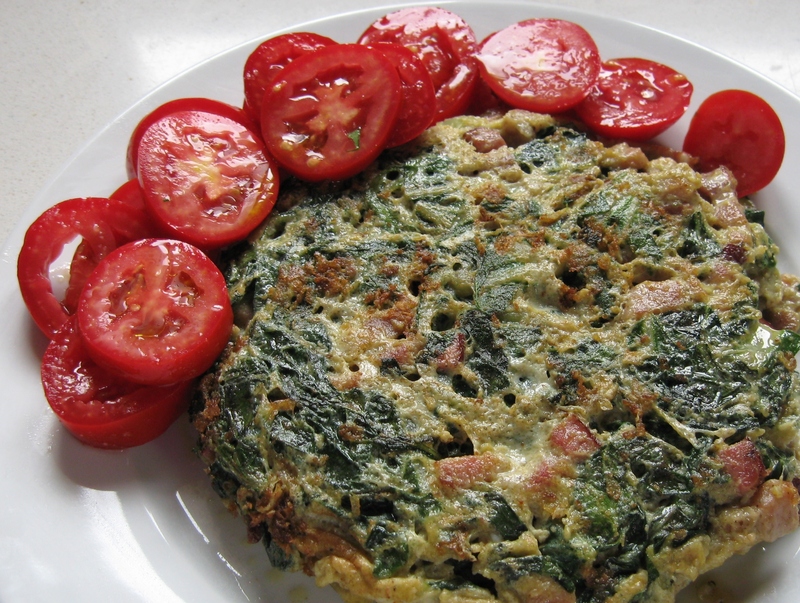 The spanish tortilla is a thick savoury cake that is golden brown on the outside and soft and eggy in the centre. Although the best know version is made from just potatoes, any vegetable of solid texture is used in combination with small amounts of meat or fish to make sucessful tortillas. Peas, broad beans with ham, asparagus and prawns, or green garlics and prawns, spinach and bacon, chickpeas, peppers, onions or any combination thereof. 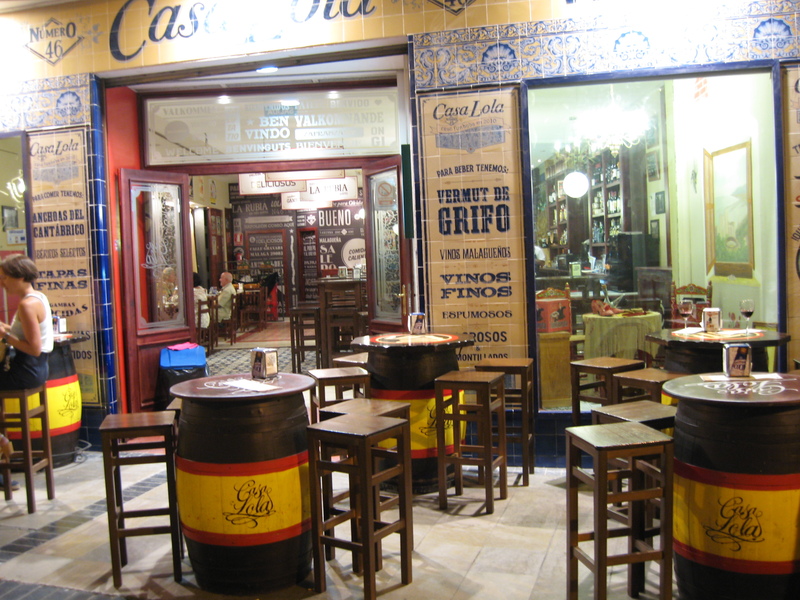 There is even one made from dates and ham which I had to try when I saw it on a menu. I have to say that it was not the most successful food combination that I have tasted. 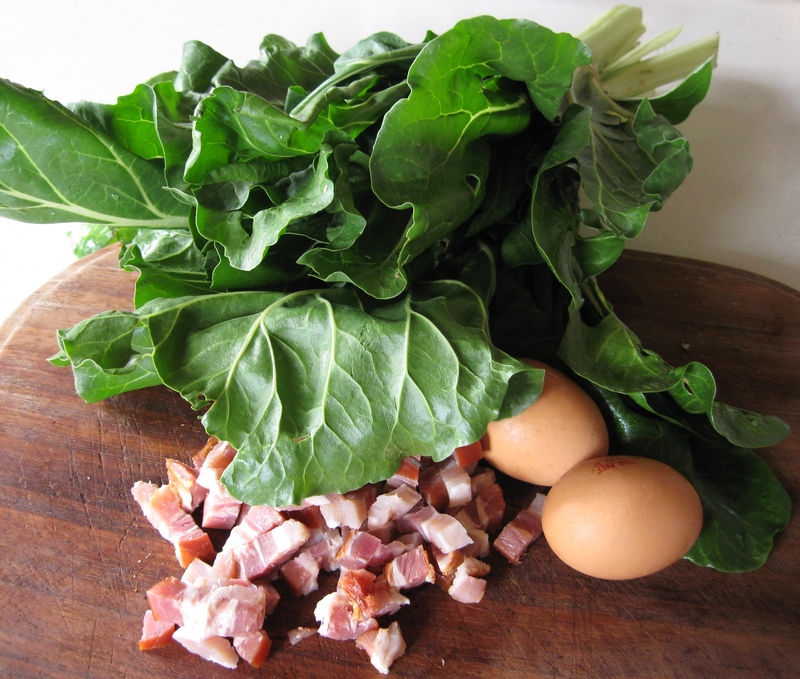 Today I have some lovely dark green chard and some smoked streaky bacon. Spinach or green cabbage can be used for this in place of the chard. The following recipe is for one person. Warm some olive oil in a large frying pan or wok. Finely chop a small onion and add to the pan. Cook for a couple of minutes. Cut the bacon into lardons and add to the pan. Cook for five to ten minutes until lightly browned. Wash the chard and cut the green leaves only into strips. Add to the bacon and toss. Cover and cook for two to three minutes, then toss again. Keep doing this until the volume of the chard is much reduced and it tastes cooked. Break two eggs into a bowl and beat enough to mix the yolks with the whites. Add the chard and bacon to the eggs and mix thoroughly. Check if it needs salt. My bacon was quite salty so I didn’t need to add more. Season with freshly ground black pepper. When you come to cook the tortilla the size of the pan used is very important. It wants to be of a size small enough that when the egg mix is poured in you get quite a thick cake. Put a good amount of olive oil in the frying pan and heat. When the oil is hot slowly add the egg mix. Cover and let it cook slowly for a few minutes. With a spatula gently tease the tortilla away from the pan around its perimeter to plump up the edge. Cook a couple more minutes and then check if it is ready to be turned over. The tortilla wants to be just solid enough to hold together as it is turned over onto a plate and then slid back into the pan. If it seems to watery still, cook it a bit longer. I gently tease the spatula under the tortilla all the way round to make sure that it is not stuck in parts. If you shake the pan and the tortilla moves then that is good. Take a plate that is a good bit larger than the pan and away from the heat place it over the pan and hold it there. Flip the pan over so that the tortilla is on the plate. Put the pan back on the heat and add some more olive oil to it. Give it a couple of minutes to heat up before gently sliding the tortilla sideways into the pan. With the spatula tease the sides of the tortilla in as before. This side of the tortilla will not need as much cooking as the first side. Lift up a side of it with the spatula to see if it is golden underneath. Invert onto a plate as before and enjoy. 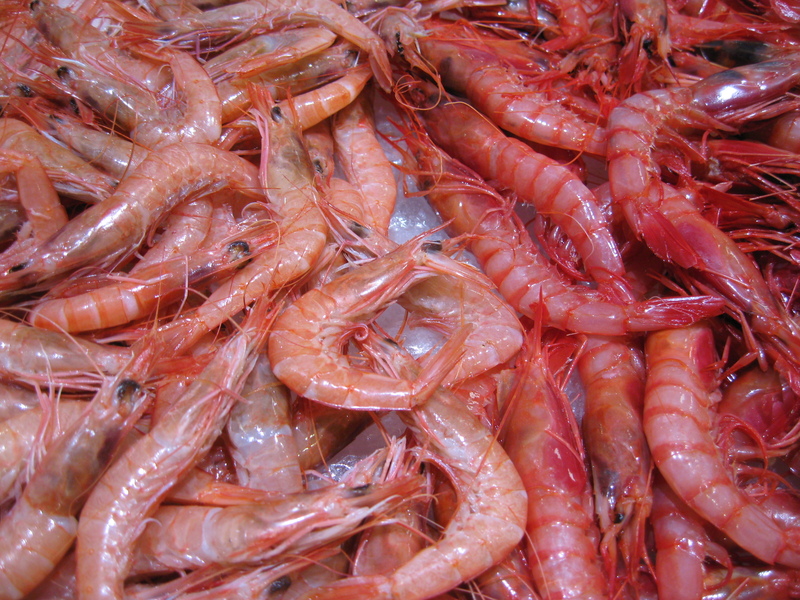 I had mine with a simple salad of tomatoes annointed with good olive oil and salt. 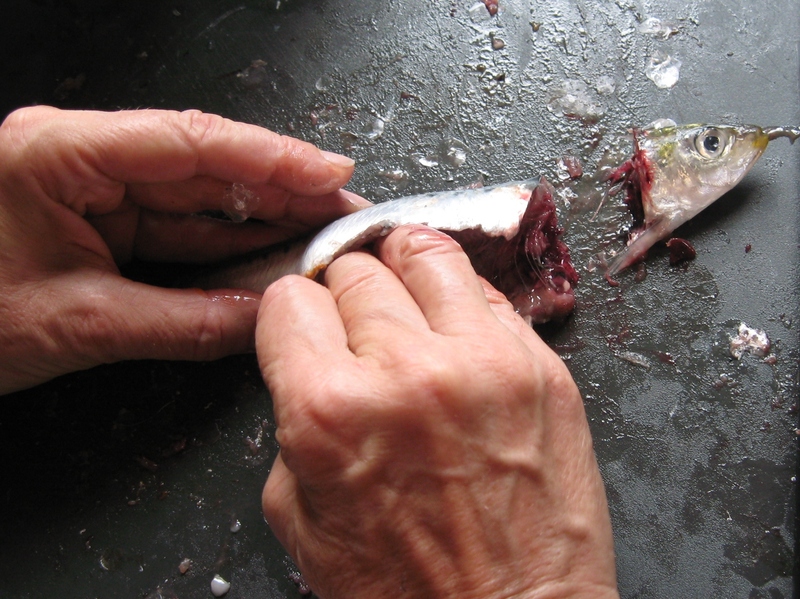 For those of you who have looked at the recipe for Sardines with a Pine Nut and Raisin Stuffing and thought – I haven’t the first idea of how to bone a sardine! – this is for you. 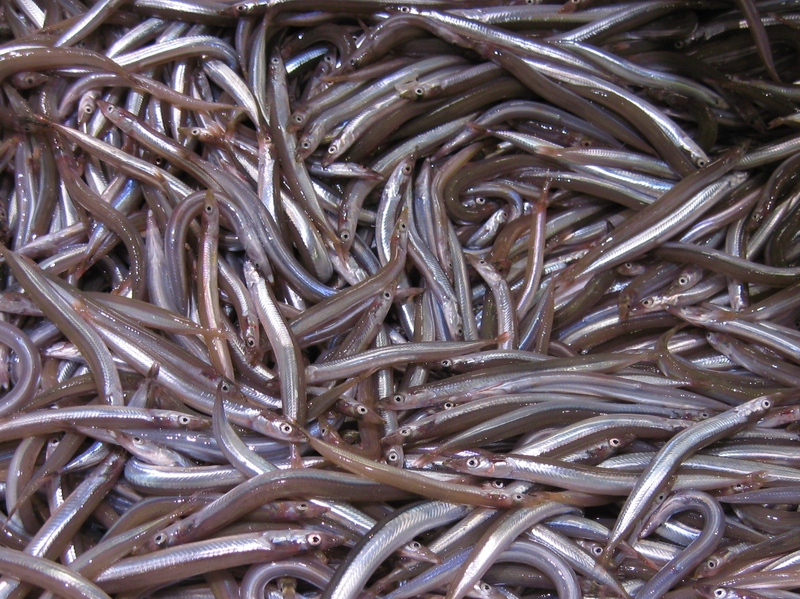 The scales on sardines are not at all sharp or well attached, they are more like thin plastic discs. 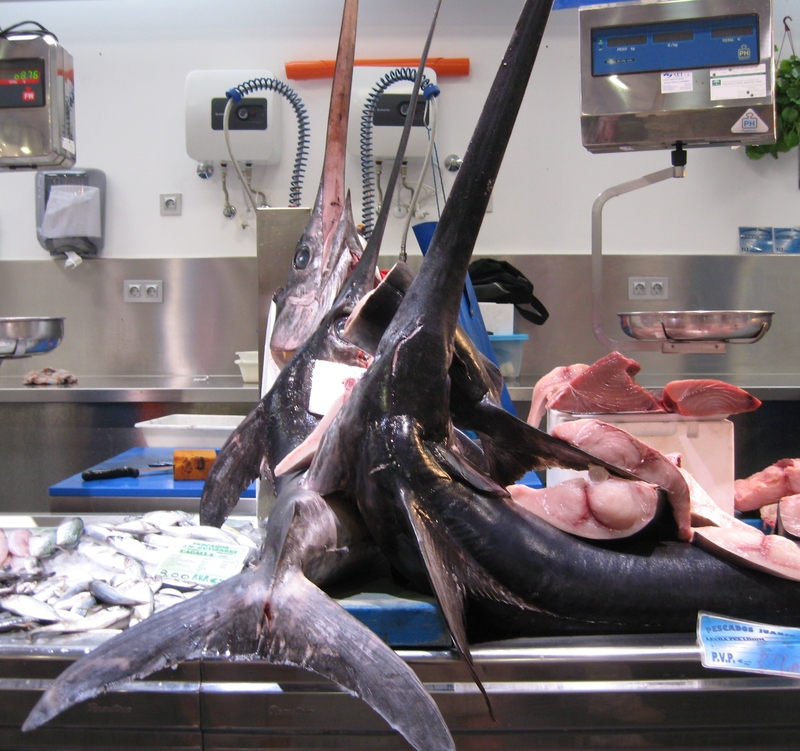 To remove them, hold the fish by its head and with an ordinary eating knife that has not got a serrated blade, run the blade from the tail towards the head and this will detach the scales. 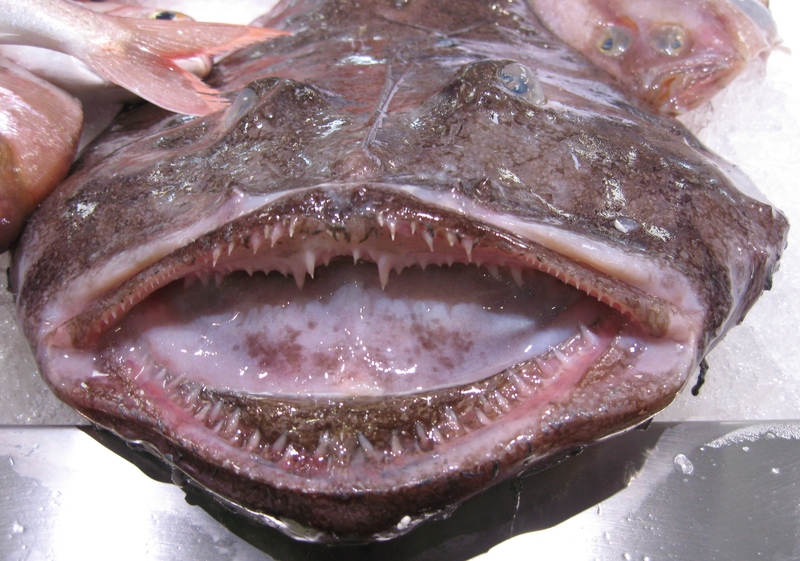 Do this all over the fishes body until the scales are all loose. 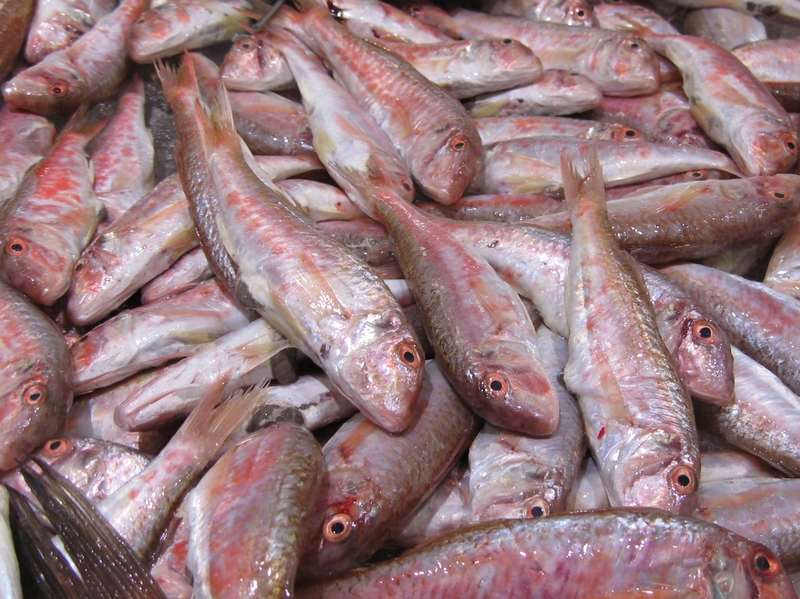 Wipe them off with kitchen roll, then rinse the fish to remove any remaining scales and wipe them dry. Wash your chopping board and the work area to remove any scales. They are a bit sticky and peskily adhere to your tools. 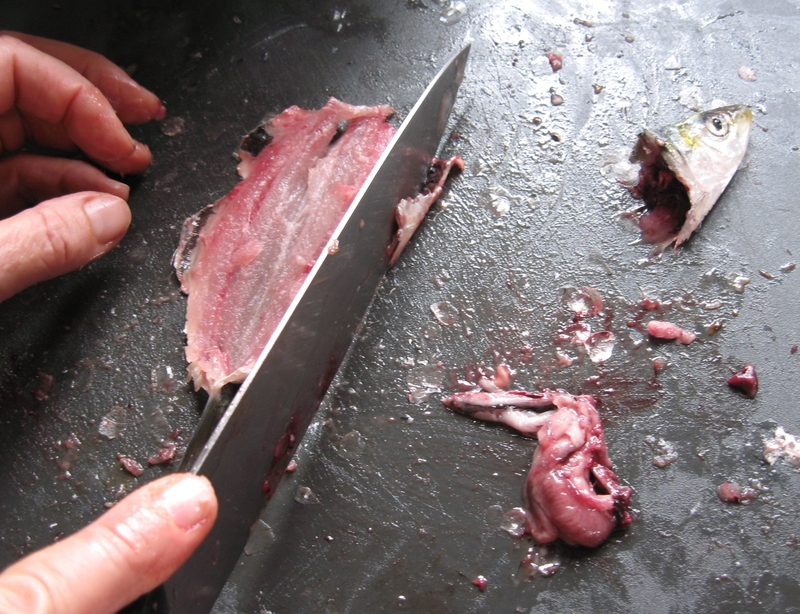 Cut the head off the fish and discard. Tuck your fingers into the belly cavity and open the body along the underneath of the belly. 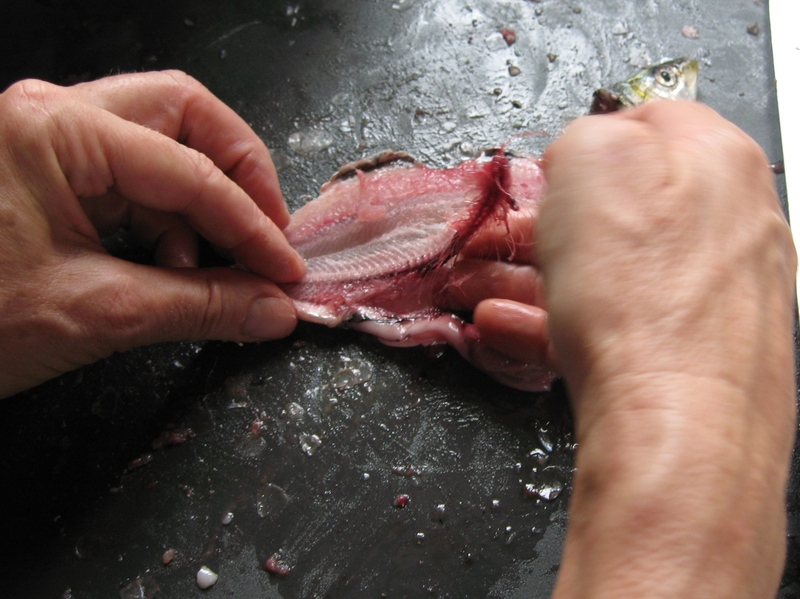 With you fingers prise the backbone away from the flesh along one side of the fish until you can open the fish out flat. 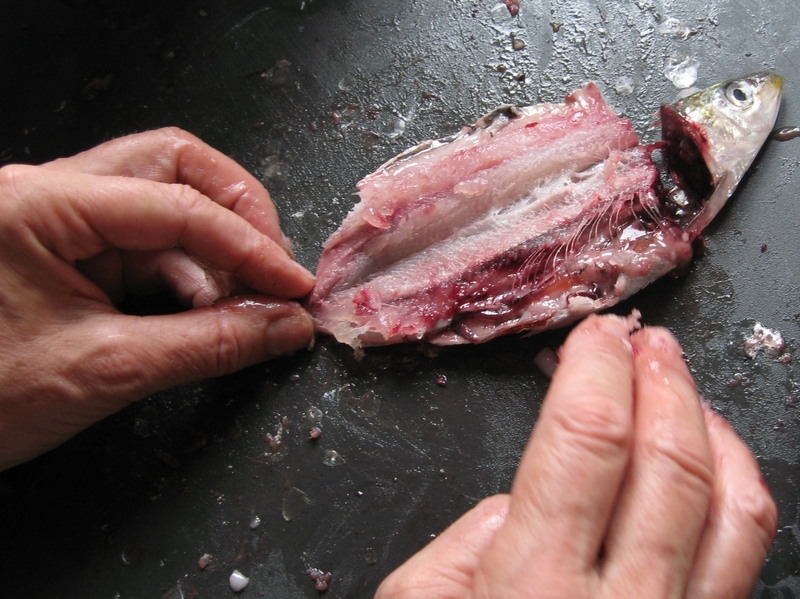 Then prise the backbone away from the flesh of the other side of the fish until it is only attached at the tail. Cut the backbone off with a knife or scissors. 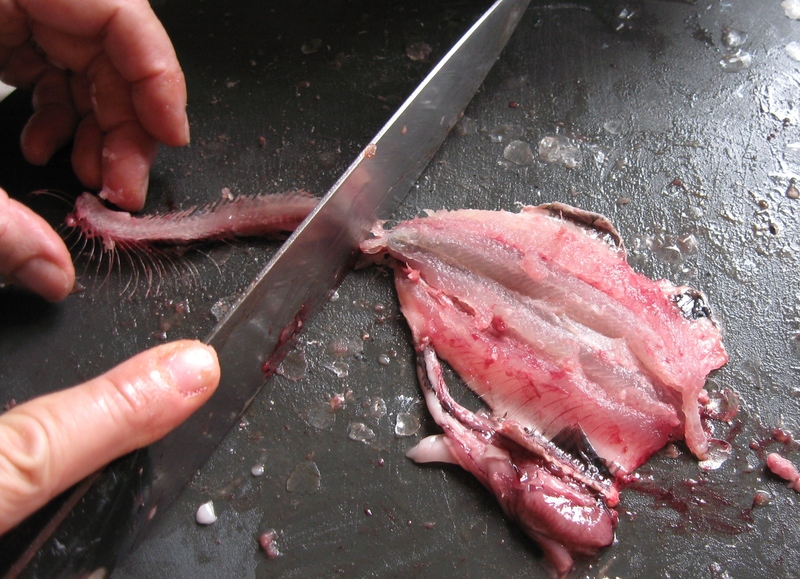 There will be a fin on one side of the fish that was below the stomach, cut this off and scrape away any guts. 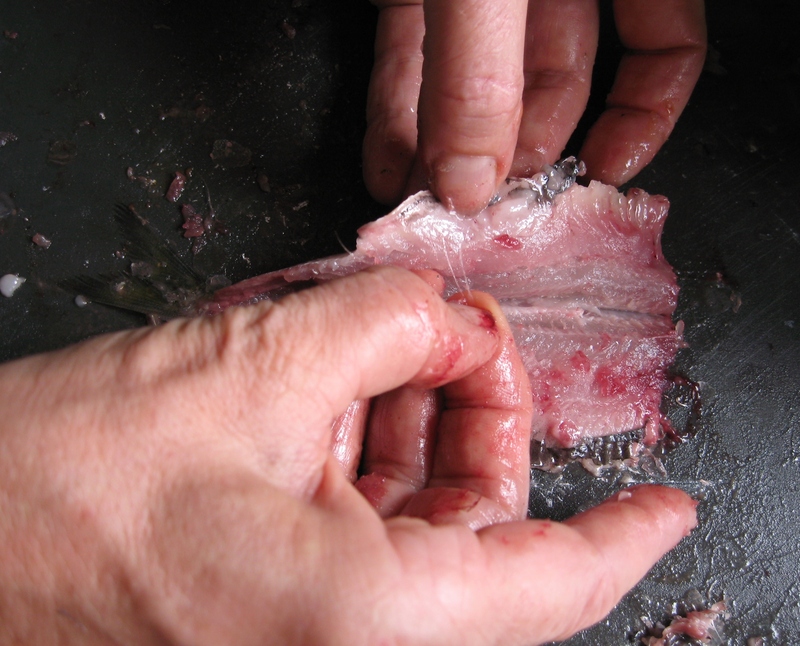 If the fish are large then check whether there are any remaining bones and remove them. Wipe the fish with kitchen roll. You are now ready to do your recipe. 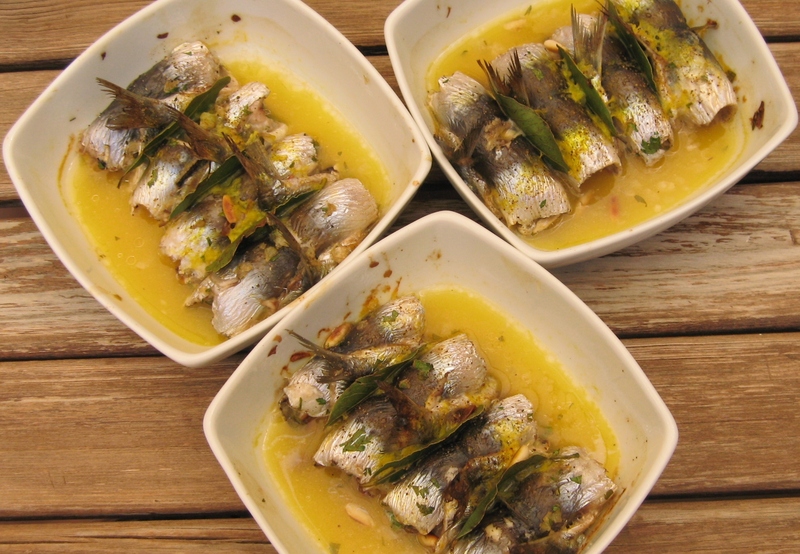 I don’t remember now where I came across this recipe for boned sardines that are wrapped around a stuffing of toasted pine nuts, raisins and onions and then moistened with orange and lemon juice before being baked in the oven, but it has been a favourite way of preparing these fish in my kitchen for many years. The combination of the oily fish, with the acid of the citrus and the sweetness of the onions and raisins is very successful – and so summery. 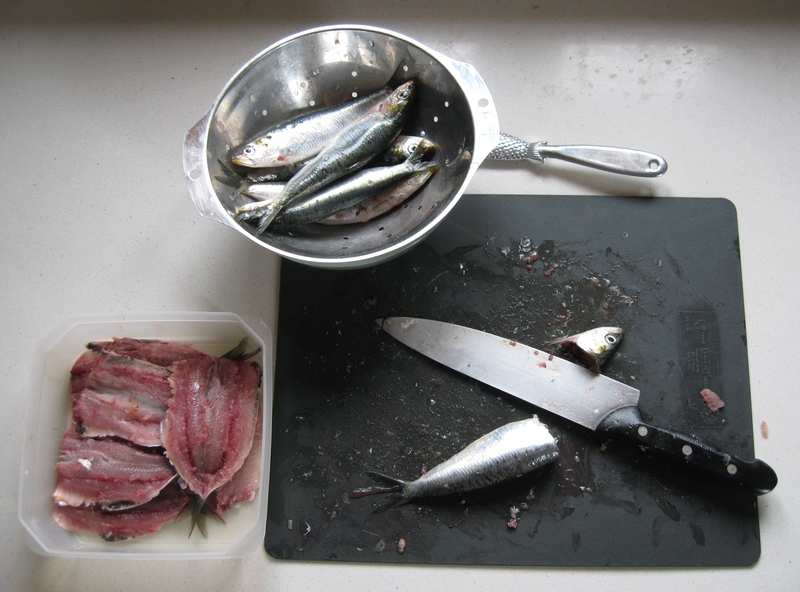 This recipe is for when the sardines are medium to large in size and need to be gutted and deboned. 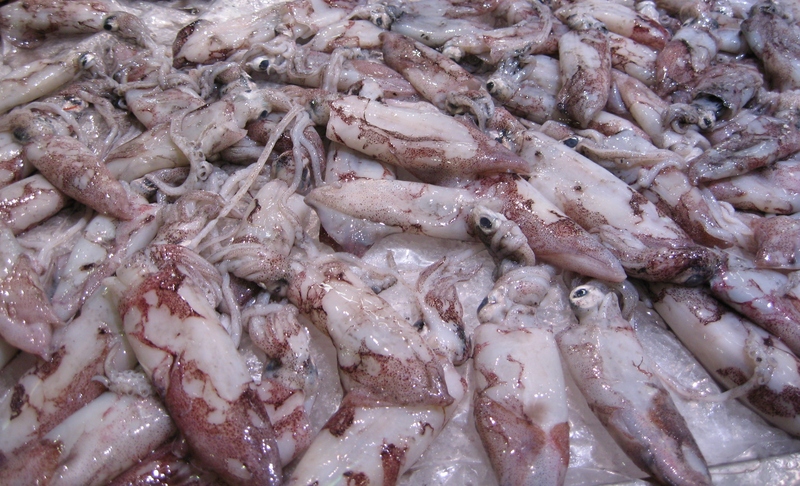 I use two or three per person as a starter and four or five if it is to be a light main course. 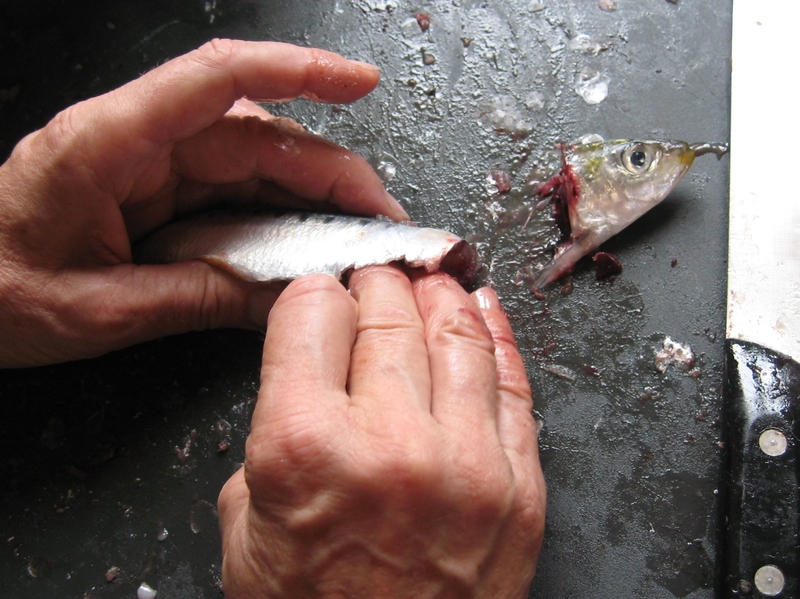 Start by descaling the sardines and then cut off their heads, gut them and remove the backbones. Open them out flat. Fry the onions until lightly browned. Add the pine nuts, raisins and parsley and mix well. 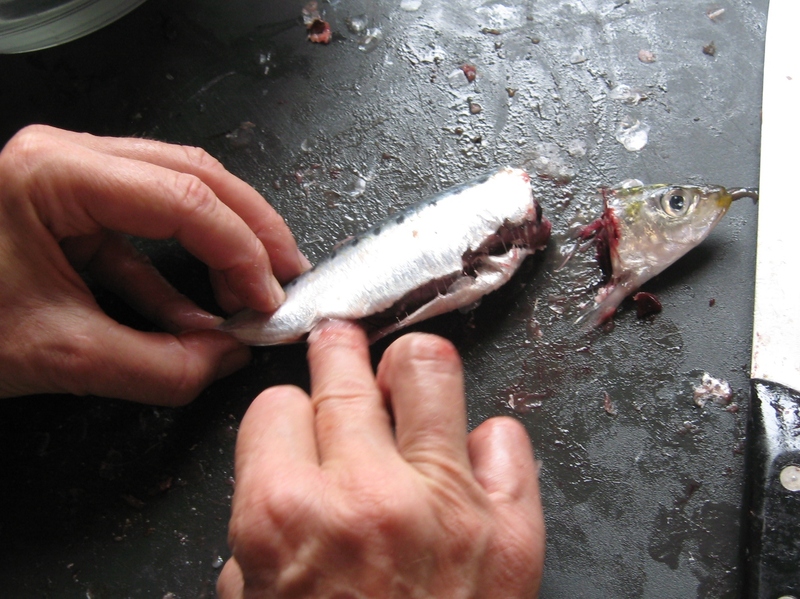 Take a small amount of the stuffing and place it at the wide end of the opened out sardine. 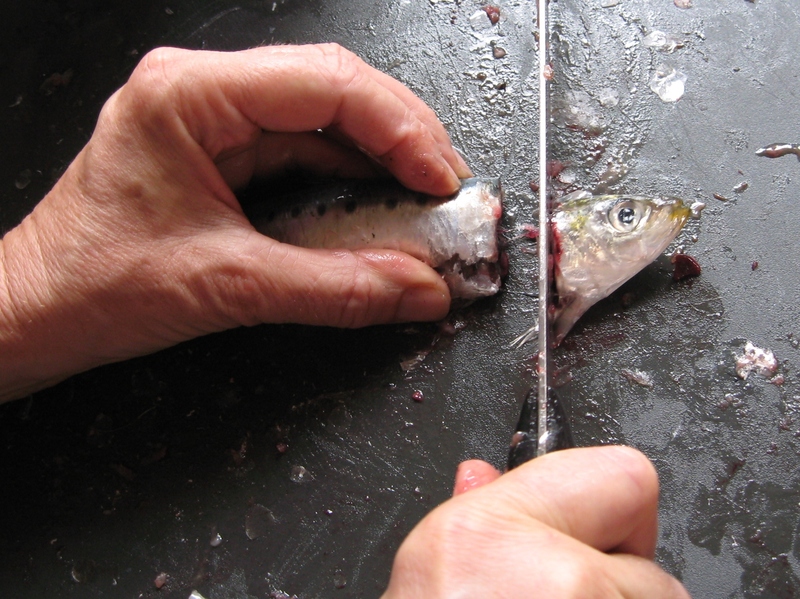 Roll the fish around the stuffing, starting at the wide end and rolling towards the tail. Put the fish into a shallow oven proof dish side by side with the tails sticking up. It can be pretty to use individual dishes per person if you have them. 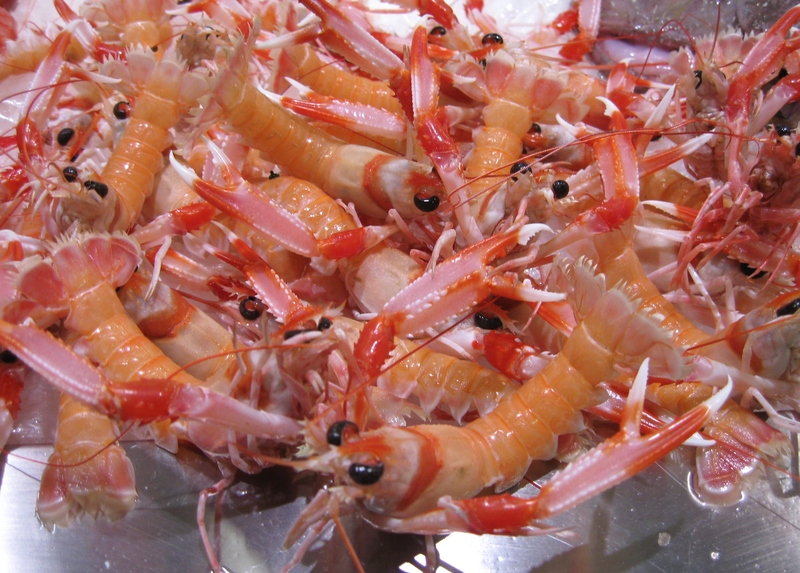 I use ramekins that will take two to three fish each if I am making this as a starter, or shallow bowls with four or five fish in each as a main course. 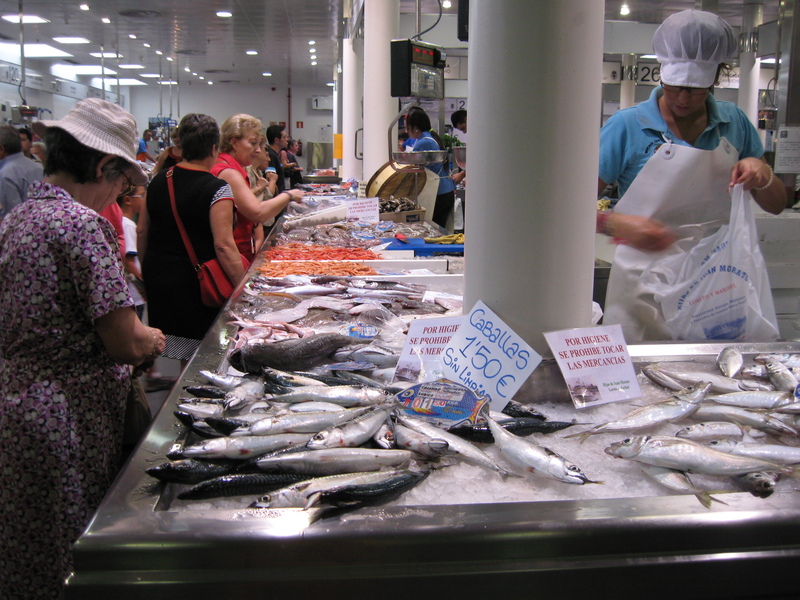 Once you have arranged all the fish, put a bay leaf in between each fish. For cooking liquid, mix the lemon and orange juice. Pour over the fish to cover half a centimetre up from the base of the dish. Bake at 180 degrees centigrade for 20 minutes. Serve with a side salad and fresh bread. An alternative stuffing is chopped capers, olives and chillies, with a white wine and lemon juice mix for the cooking liquid. 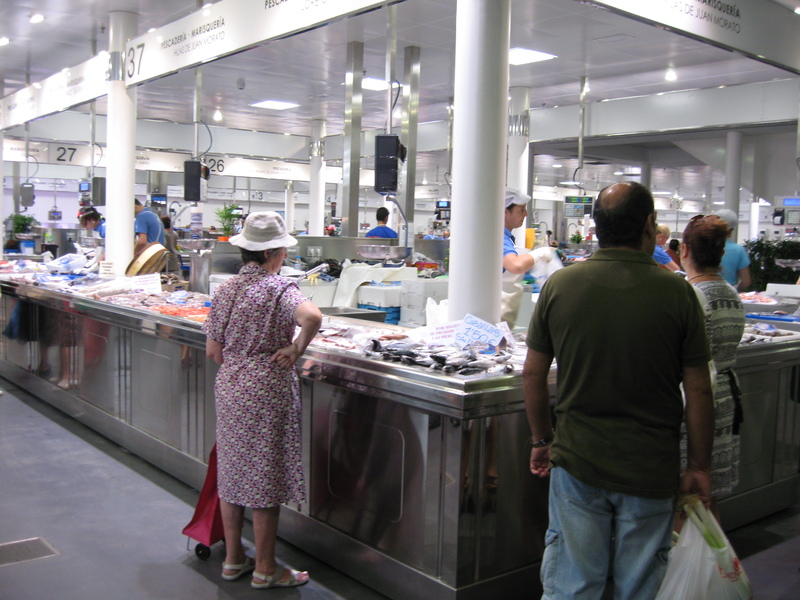 A recent visit to the nearest city and its newly restored and reopened fish market……….